Region: Shenandoah Valley - Near Blue Ridge Parkway at I-64 and I-81. 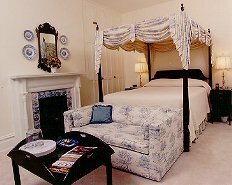 Relaxing, smoke-free, adult atmosphere, providing spacious period rooms, canopied beds, private modern baths, in-room cable TV/VCR. Complimentary refreshments, full skip-lunch breakfasts included. Dining, shopping, exercise facilities nearby. Heart of Shenandoah Valley, history, wineries, antiques, hiking, biking, golf. Catering to mid-week business traveler. 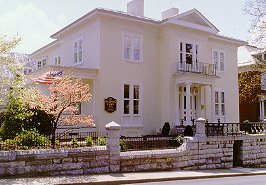 This and other Staunton Bed and Breakfast Inns can be found here in The Register.